Many people dream of finding some long-lost treasure – to think that perhaps a chest full of gold is buried underneath their feet and that you can retrieve it with just a shovel!. For most this is just a fantasy, but there have been some stunning finds, retold in Brian Haughton’s new book Ancient Treasures. Haughton devotes sixteen chapters to various discovered treasures, and one chapter to fake treasures. These include many well known discoveries, such as the Staffordshire Hoard, Tutankhamen’s tomb and Priam’s Treasure. Many of these accounts do read, as Haughton notes, “more like a movie script than a factual account,” as what happens to the treasure after it was found is just as interesting as the treasure itself. One will find it sad to read how many of these stories involve looters, criminals and various shady characters who were solely interested in gaining personal fame and fortune. 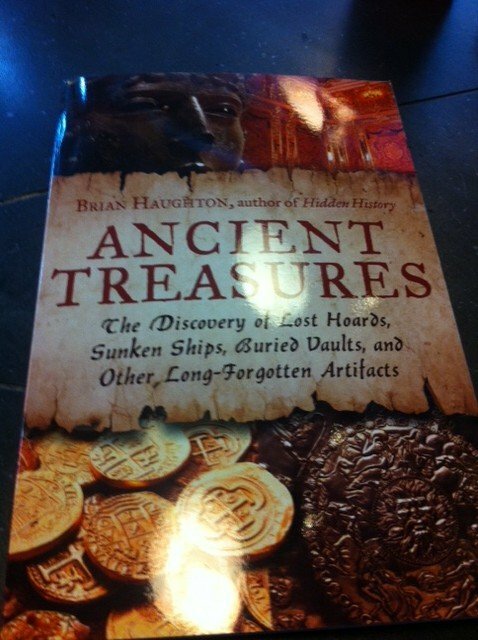 Haughton does an excellent job in relating how looting and theft continues to be a serious problem for those interested in archaeology and preserving our past. The chapters mostly focus on how the treasure was discovered and what eventually became of it, while relatively little space is provided to talking about why these artefacts are important or what they tell us about the people who made them. The final chapter, on Fake Treasures, reveals some of the more interesting scams, including one that fooled the Louvre.